The kids have finally gone back to school and by the looks of the weather, summer is officially over! But there’s no need to worry, as this month’s Dog of the Month is the perfect back-to-school pick me up. Loaded hot dogs are all the rage at the moment, but we believe sometimes it’s best to just keep it simple. 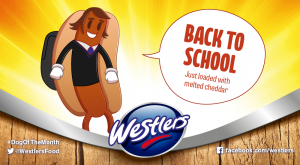 So this serving suggestion is a classic, with just three ingredients, a Westlers Beechwood Smoked hot dog, soft white hot dog bun finally loaded with mature cheddar and melted. Each month we’ll be celebrating the versatility of the humble hot dog with a themed hot dog topping, so look back through our twitter page for the Wimbledon themed Classy Dog, or the festival themed Rock Dog. Plus, keep your eyes open for upcoming serving suggestions for Christmas, Easter and more! We love hearing how you top you Dog, so if you have any serving suggestions make sure to send them our way!